Khosit Phetpradab’s inspiring run into his first major final, and Kento Momota’s serene march to his 47th match victory this year, headlined the semi-finals action at the DAIHATSU YONEX Japan Open 2018 today. Thailand’s Phetpradab, World No.26, has never gone this far in a tournament of this level, and that he accomplished with yet another powerful attacking performance against another surprise semi-finalist, Korea’s Lee Dong Keun, 21-12 21-16. Agile in defence and unrelenting in attack, Phetpradab sank to the floor after the fifth of his diving retrievals on match point fell unchallenged in Lee’s court. Momota, who has achieved a few milestones for Japan since his comeback in July 2017, moved one step closer to yet another accomplishment. If he wins tomorrow, Momota will become the first Japanese to win a Men’s Singles title at the Japan Open. There will be local interest in two other matches as well, as Nozomi Okuhara in Women’s Singles and Yuki Fukushima/Sayaka Hirota in Women’s Doubles entered the title round. The Momota-Axelsen semi-final was a match with two distinct parts. Axelsen, who had only one win against the Japanese – dating back to February 2014 – in nine previous matches, settled down for marathon rallies. Unusually for Men’s Singles, it was all mostly high clears, baseline to baseline action, interspersed with some probing drop shots. A 50-shot rally was followed by one of 60 shots, followed by one yet longer, as both decided to pitch their tents, so to speak, in a test of the other’s patience and resolve. Axelsen’s best phase came after one such rally, and he capitalised to fire off some quick winners and go 17-13 ahead. It was at this stage that the game turned, totally against the run of play. Momota stayed in the hunt, giving nothing away, while Axelsen helped his rival’s cause with some loose play. Momota quickly drew level, and then Axelsen gave out all the wrong signals with a bizarre shot between his legs from the baseline after initially appearing to let it fall. A few other wide shots followed, and soon Momota was ensconced firmly in the driving seat. With momentum on his side, Momota opened up in the second, playing with greater liberty and keeping Axelsen guessing. At the net he was impeccable, keeping the shuttle just over the tape and pouncing on anything that rose just above. To add to Axelsen’s woes, the Dane just did not show the stubbornness he had for the early part of the match, and Momota only had to play well within himself for the inevitable win. The Japanese converted on the first of his nine match points as Axelsen returned weakly into the net. It had been a test of discipline, and Momota had prevailed: 21-18 21-11. The Women’s Singles final will feature current World champion Carolina Marin (Spain) against her predecessor, Nozomi Okuhara. 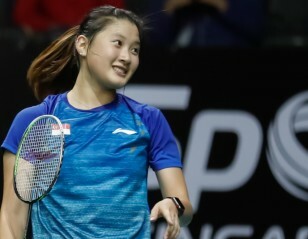 Marin enjoyed a breezy victory over China’s Chen Yufei, 21-12 21-13, while Okuhara was just as comfortable against compatriot Aya Ohori, 21-12 21-12. In Men’s Doubles, Indonesia’s Marcus Fernaldi Gideon and Kevin Sanjaya Sukamuljo earned a shot at their sixth major title this year, recovering from a mini-crisis today against China’s He Jiting/Tan Qiang. The Indonesians were outgunned by the upcoming Chinese 21-14 in the second game before they recovered their wits and imposed themselves early in the third: 21-16 14-21 21-13. 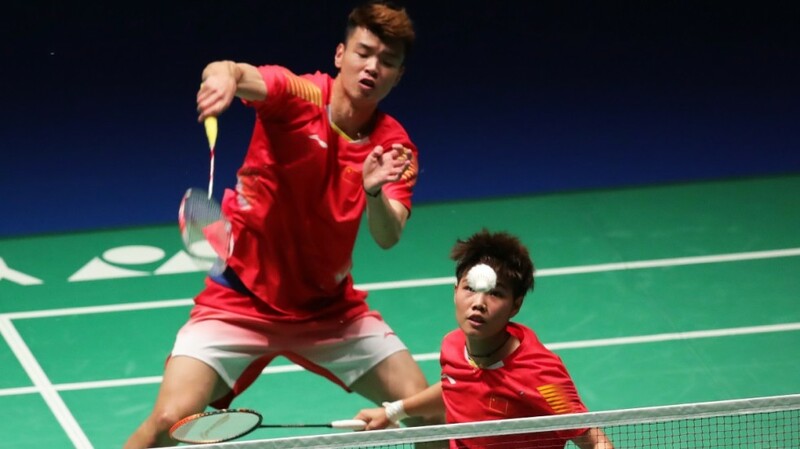 They next take on China’s Li Junhui/Liu Yuchen in a clash between the Asian Games champions and the World champions. The Indonesians have won all of their last eight finals; their last defeat in a final being at the Denmark Open in October 2017. 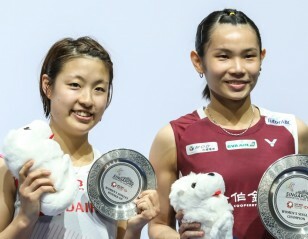 The Women’s Doubles final will be a rematch of the 2017 World Championships final between eventual winners Chen Qingchen/Jia Yifan (China) and Yuki Fukushima/Sayaka Hirota. Fukushima and Hirota were dominant against Indonesia’s Greysia Polii/Apriyani Rahayu to begin with, but it was a more dogged contest as the match progressed, and the Japanese had their backs to the wall at 14-17 in the second before they won seven of the last eight points, and with it the match, 21-12 21-18. In the other semi-final, third seeds Chen/Jia did not have as much trouble, as they stayed ahead of compatriots Du Yue/Li Yinhui all through the match, 21-17 21-15. Wang Yilyu and Huang Dongping (featured image) have fallen to compatriots Zheng Siwei and Huang Dongping in all four of their encounters this year, including the World Championships final. Tomorrow will give them a chance to make amends. The Chinese pair reached their fourth major final this year with a comprehensive 21-15 21-17 victory over local hopefuls Yuta Watanabe and Arisa Higashino. It was their fourth straight defeat of the Japanese. And while it might have taken them 52 minutes, the Chinese never relinquished control. Most of that was due to the superlative play of Wang Yilyu, who was a powerful presence around the court, and his fusillade from the back meant Huang Dongping only had to hold her end up. That she did admirably, giving the Japanese no leeway. For their part, while Higashino was as usual electric in her movements at the net, Watanabe disappointed. The left-hander couldn’t impose himself on the game like his opposite number, and so confident were the Chinese of defending against him that they frequently employed the flick serve, inviting him to smash. In an earlier semi-final, World champions Zheng/Huang reached their sixth final this year beating Malaysia’s Chan Peng Soon/Goh Liu Ying 21-16 17-21 21-14 in an hour-long battle.